Sun Lakes Oakwood golf course homes are available for sale in this gated active adult retirement community. So don’t delay as homes are selling quickly. Although inventory is low, homes are available for those that are ready to find their next home in a 55+ community. Oakwood Country Club is the newest of the five Sun Lakes communities. Homes are available on all three of the nine holes of golf. Golfers rotate an 18 hole game between the 27 holes of golf in Sun Lakes Oakwood. Sun Lakes Oakwood Golf Course Homes are Waiting! Many of our clients tell us they want a home with a view. So, what is more enjoyable than sitting on your covered patio sipping your morning coffee? And watching the sun rise and the golfers play on lush green grass? The evening sunsets are stunning from your golf course home too. You will find both single and two level golf course lot homes. And, all two level homes have main floor living with the master suite and all living space on the first floor. Two bedrooms and a bath are on the second level and perfect for guests. Homes that are in good condition and a great location sell almost as quickly as they go up for sale. 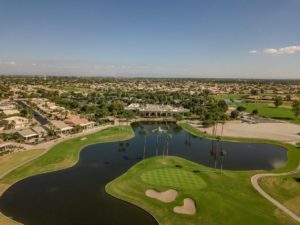 If you are looking for Sun Lakes homes on the golf course, you want a Sun Lakes AZ Realtor who knows the area and the market value. As a result, you will find that the Kolb Team lives in Sun Lakes and has sold over 330 homes and over 125 million in real estate. And that means you are getting the most experienced real estate team to help you find your next home. We can help you find the right home and help you negotiate a deal to get the home you desire. For more information about Sun Lakes Oakwood Homes or any home in Sun Lakes, Arizona, call 480-440-0849 or contact us here.